METALICUS! METALICUS! METALICUS! 30% OFF for 3 DAYS! 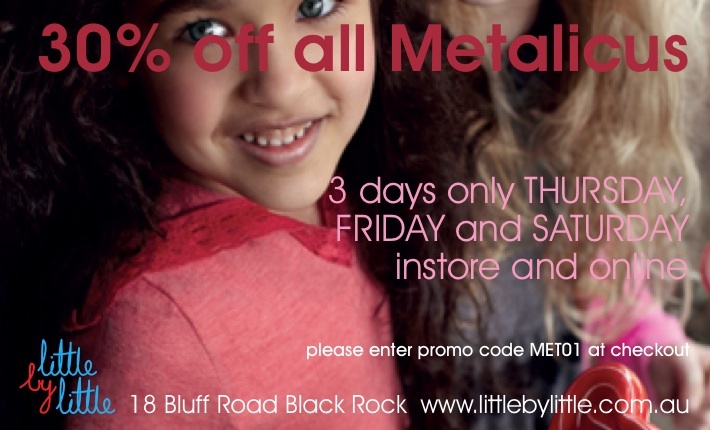 At Little by Little we know how much our customers LOVEEEEE Metalicus! So do we! Hence we rarely put it on sale! So its with great pleasure to tell you that Metalicus is reduced for 3 Days ONLY, Thursday (today! ), Friday and Saturday! 30% OFF EVERYTHING! Headbands, Basics, Fashion pieces, Tights, Mini and Miss Metalicus! AMAZING! Hurry, hurry its online and instore! Online please make sure you include promo code MET01 at checkout otherwise no discount!